I might be stretching here but we’re almost half way through the alphabet and I’m still talking Greek so there’s something to say for that. Live hidden is from Epicurus. He said this because he believed that politics troubled men and didn’t allow them to reach inner peace. If you’re watching the republican primary or have Barak Obama’s campaign on your radar perhaps you’ll agree. It’s like watching a train wreck and not exactly good for serenity now. So Epicurus suggested that everybody should live “Hidden” far from cities, not even considering a political career. I’m not saying everyone should be anti-epicurian on this political career thing but I do wonder how this works in my writing. There was no deeper meaning. Maybe it was the Caesar thing that created high expectations – or the echo of Shakespeare’s words. I don’t know but I nodded and said, “Yes… a deeper meaning.” And of course wondered, did I have to have a deeper meaning and should I just give up and throw the play away before someone got hurt? I know, if I’m honest, I write fiction based on my values and life experiences – where else can my ideas come from? But these are tempered by the needs of my characters. They are filtered and so they become both mine and theirs. Some represent me and some don’t (or better not – but what if they do?). I set out to tell stories. I don’t usually set out to be engaged in politics. But if I do, the ideas will certainly be welcomed into the fracas. 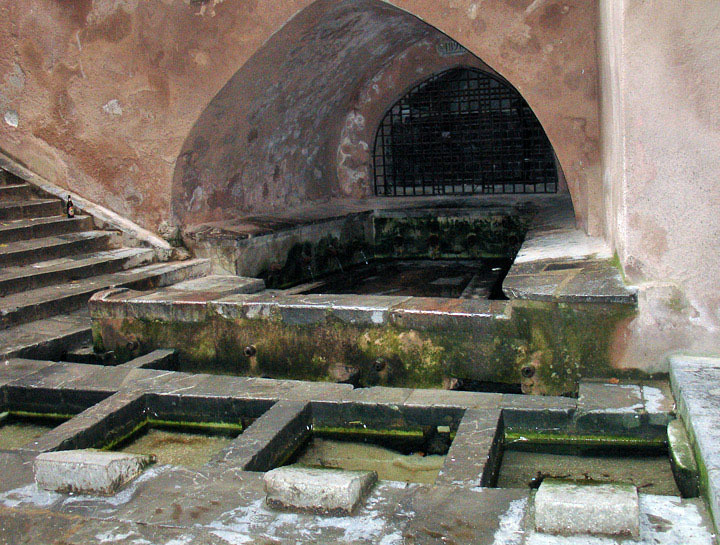 Did you know that Roman laundries used urine as bleach? It gets the whites whiter. Now what kind of political statement is that? What’s the deeper meaning in pee? What do you do with your political ideas? Do they work deliberately into your stories or do they… live hidden? This entry was posted on April 13, 2012 by Joe Lunievicz. It was filed under A-Z Challenge, Blog, Critiqueing, On Writing, words . I try to weave things in as theme, as underlying subtext. I mean characters will be outspoken on certain things, of course, they’re human, after all, but as the author, it seems heavy handed to get preachy. On the other hand, I think it’s difficult to keep from implying anything at all. I just finished a book by Elizabeth Nunez called Boundaries that was a clear cultural-political (the politics of race) story that was truly authentic to its characters and yet didn’t seem forced at all. These characters lived and breathed it. She has something to say and deftly used her characters to say it. Very cool. Great post. I think my political views live hidden when it comes to my writing. Any politics that do creep in are for the characters to worry about and not me. I’m just here to tell stories not to write novels with a political agenda. Okay, first of all, I know from experiencing manymanymanymanyMANY mornings waking up to discover that one of my kids has wet the bed that urine does NOT get your whites whiter. Maybe it helps if your whites are grungy to begin with, though. That would be pretty neat. As far as my political views go, I think they find their way into my writing, albeit subtly. Not all of my writing, but a lot of it. I don’t think I can bring myself to tell a story that says something I disagree with. I loved this post, and I laughed at the whole laundromat while people were getting their lean and hungry on is awesome. “Deeper meaning in pee” has to be one of your best phrases ever. I think the uses of pee throughout history are really entertaining, and I think you should devote an entire blog to pee. One ode to pee coming up. Perhaps right after the A to Z is over. Do I really have to say this? “P” (ee, iss) comes up on Wednesday. I know, but won’t everyone be using pee as their word? Everyone? Either way is fine with me. All I really need is the title of the post so I can send traffic your way from the A to Z blog.